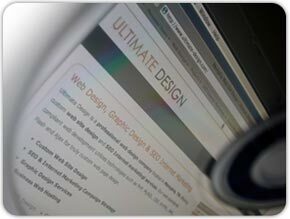 Ultimate Design develops custom websites from the ground up using the latest in Internet technology, specifically with web marketing and promotion in mind. Our web design services are fully integrated with our graphic design and SEO Services, providing a project workflow which enables you to seemlessly begin or continue a project with Ultimate Design. Ultimate Design is experienced in many web based technologies and will work with you to select the right ones to meet the needs of your project. Every web site we develop is hand coded to be web standards compliant using CSS and XHTML. Adopting the web standard helps to ensure cross-platform, cross-browser compatibility and maximizes future scalability. Separating design from the page content introduces many advantages to page design, not least of which is the ease in which a design can be integrated into a dynamic, database driven web site. The use of proper markup code assists search engines in correctly identifying specific page elements, which leads to a more accurate assessment of your web page content. In practice this means in searches for which your web site is returned as a result, your site will be relavant and therefore the visitors more qualified. A content management system can enable you to easily manage your site content, often with little or no knowledge of HTML. There are many commercial and free content management systems, many of which can be customized to specifically meet your needs. If your project has specific requirements, Ultimate Design can build a fully customized CMS based upon your specifications, while maintaining all the necessary design elements for a successful SEO Campaign. All our web development is based around Linux, Apache, MySQL and PHP (LAMP).